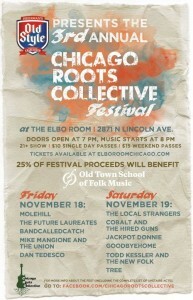 Molehill will headline the first night of the Chicago Roots Collective Festival Friday, November 18th! So much music to take in this night! Read below to check out the lineup. For tickets to Friday evening’s performance you can purchase HERE. The Elbo Room is a small venue so this show could very well sell out! 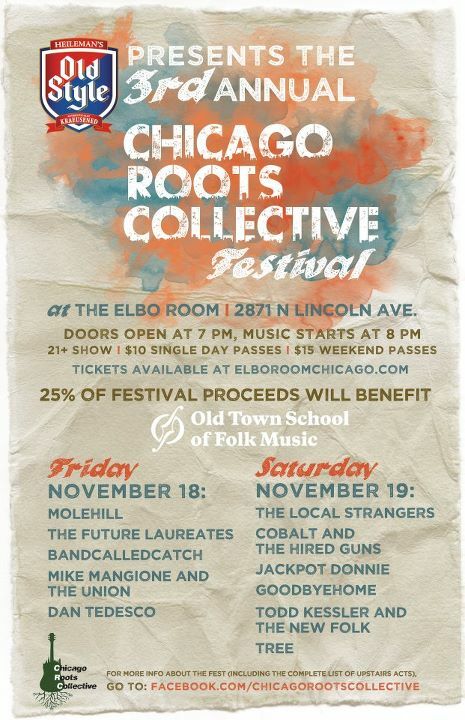 The 3rd Annual Chicago Roots Collective Festival will be held on Friday, November 18th and Saturday, November 19th at The Elbo Room. Over 25 amazing local acts will play on both floors of this nifty room. Oh and get this: 25% of festival proceeds will benefit the Old Town School of Folk Music. Both nights of the festival are 21+, doors open at 7 pm, and non-stop music goes from 8 pm until 1 am. Tickets can be purchased in advance at www.elboroomchicago.com We encourage you to buy your tickets in advance, as space in The Elbo Room is limited.